A yellow block with eyes. 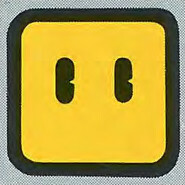 Rotating Blocks, also known as Spinning Blocks, are yellow eyed blocks that first appear in Super Mario World. 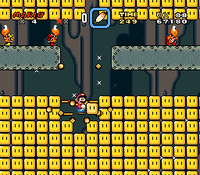 When hit from below or the sides, they briefly spin around, allowing Mario to pass through them. In Super Mario World, Rotating Blocks replace Brick Blocks from previous Super Mario games, and share most of those blocks' attributes. Normal Rotating Blocks spin around for a short time when hit from beneath or attacked as Caped Mario, but some act as ? Blocks and reveal an item. Super Mario can destroy normal Rotating Blocks with a Spin Jump from above. Chargin' Chucks can also destroy Rotating Blocks by charging into them. Also, enemies such as Koopa Troopas and Goombas may hide in Rotating Blocks, and break out to attack Mario once he approaches him. In Super Mario Maker and Super Mario Maker for Nintendo 3DS, Rotating Blocks replace Brick Blocks in the Super Mario World style. To be consistent with the other styles, Rotating Blocks are affected by P Switches instead of Empty Blocks, unlike in Super Mario World. Rotating Blocks reappear in Super Mario Maker 2. Rotating Blocks appear in the Super Smash Bros. series in Melee's Yoshi's Island stage (in Super Smash Bros. Melee, Super Smash Bros. Brawl, Super Smash Bros. for Wii U, and Super Smash Bros. Ultimate), and in the Super Mario World style of the Super Mario Maker stage (in Super Smash Bros. for Nintendo 3DS / Wii U as DLC, and Super Smash Bros. Ultimate), working as they originally did, though they are 3D in Yoshi's Island (they turn 2D when rotating). The dummies that appear in the Ring Challenge mode of the soccer sport in Mario Sports Superstars are made of Rotating Blocks, flipping over when they are struck by the ball. The Boards from Super Mario RPG: Legend of the Seven Stars, Bike Pads from Mario & Luigi: Superstar Saga, and Yellow Blocks from Paper Mario resemble Rotating Blocks. Although actual Rotating Blocks do not appear in Mini Mario & Friends: amiibo Challenge, there are blocks that have an identical design, primarily found in Mini Luigi's world, Moonlight Mansion. They initially appear as transparent Empty Blocks from Super Mario World, but will turn solid and yellow when a nearby candle is lit, allowing the Minis to walk on them. Kurukuru Block From "kurukuru" (くるくる), Japanese onomatopoeia for spinning. ↑ Super Mario World: Super Mario Advance 2 instruction booklet, page 19. ↑ Nintendo Mario Mania Player's Guide. Page 57. This page was last edited on April 5, 2019, at 20:53.